You have to go there. Really. I have several new friends who just moved to Texas from other states. They asked and have been told about where to get the best BBQ, and they’ve learned about the odd quirks of our streets-that-change-names-every-couple-of-miles. The longer they live here, the greater the odds that they will learn how to two-step, where to catch great live music, and that tacos for breakfast, too. There is one thing, however, that I have been urging them to experience while they are here and they just don’t seem to understand it’s cultural importance. I am speaking about going to Buc’ee’s. If you have to ask why, it means you have not been yet. You really should go. Buc’ee’s is a roadside refuge, but not just a place to fill your tank and stretch your legs. 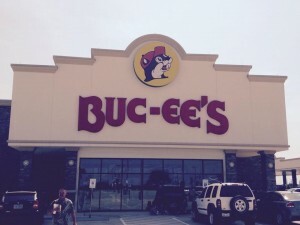 Whenever you drive between Texas towns, it is important to make sure your route will pass a Buc’ee’s or the trip will be incomplete. Now, I need to make it clear to the newcomers (the natives will know this already) which Buc’ee’s I am talking about. 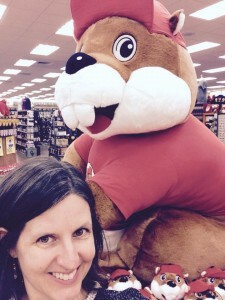 You might drive down the highway and see a regular looking gas station/convenience store with a sign that says, “Buc’ee’s.” But that is NOT WHAT I AM TALKING ABOUT. Why would I send you to regular? I am sending you someplace extraordinary. You will know you are headed to the right place when you see huge billboards announcing, “Clean Restrooms Ahead. We Guaranpee It! 21 Miles” (And that is true. You should have a serious talk with your bladder about timing your stop to meet this need – it is worth it.) I was headed toward the town of Waller and passed a sign that said, “Waller You Waiting For? 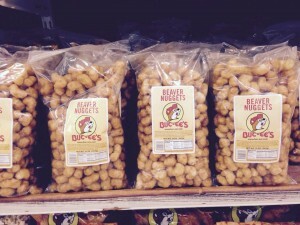 8 Miles.” Buc’ees loves a good pun. That is just the side entrance. You can tell you are at the right place because IT IS AS BIG AS A HOME DEPOT. Maybe even a Walmart. It is immediately evident that this will be more than a pit stop, it will be a life changing road trip experience. 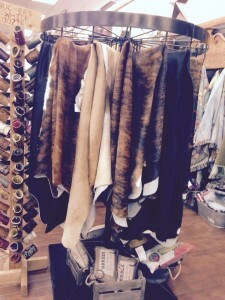 At Buc’ee’s, you can find back-to-school fashion, napkins for your next fancy cocktail party and – y’all! – Texas-themed birdhouses for your Christian birds. So far, you might think Buc’ee’s isn’t that much better than any other stop along the road. And you really need to be getting on your way…except, haven’t you been thinking about redecorating your house? And wouldn’t it be convenient if you could do that now, while you are driving away from your house? At a place that also sells snacks and birdhouses? 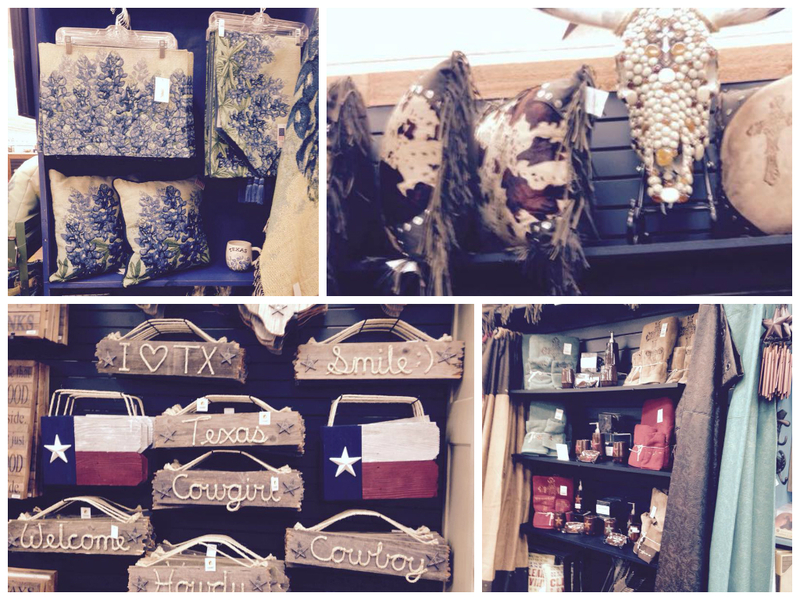 What if you could get a beaded cow skull, faux-leather pillows, and charming wooden signs for the walls in your new Texas home? What if you could get placemat, napkins and a table runner featuring the Texas bluebonnet? Or a faux leather shower curtain and matching towels? WHAT IF YOU COULD GET THIS ALL IN ONE PLACE? Perhaps you need to take it up a notch. All those decorative items are just a little too tame for you? Okay. Why don’t you treat yourself to a cowhide? 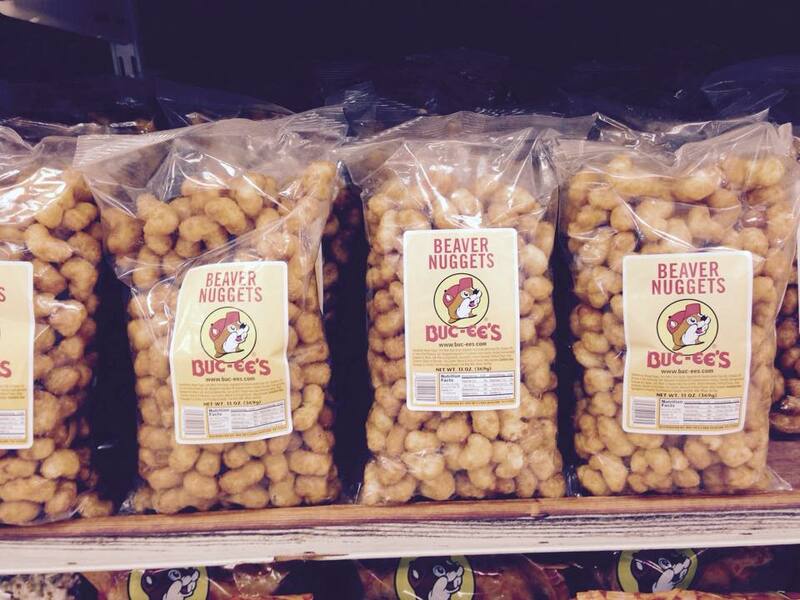 Because they sell those at Buc’ee’s. And that isn’t even all -I could go on all day. Camo-themed items of all sorts. Everything imaginable in the shape of Texas – wooden things, stone things, soap things, lots and lots of Texas-shaped things. There is framed “art” on the walls leading to the famous bathrooms. And, of course, you can get your own Buc’ee to take home. This entry was posted in Humor, snark by Mary Keenan. Bookmark the permalink. I got my husband at Buc-ee’s. No kidding. They really DO have everything! Ha! I love that, Carol!